Drawing is a good word. When you sit down to render an image, you are pulling it out of the air, really. I also feel the act of drawing is pulling me. It nudges me to look closely, to pay attention and to remember. It forces me to make decisions along the way. 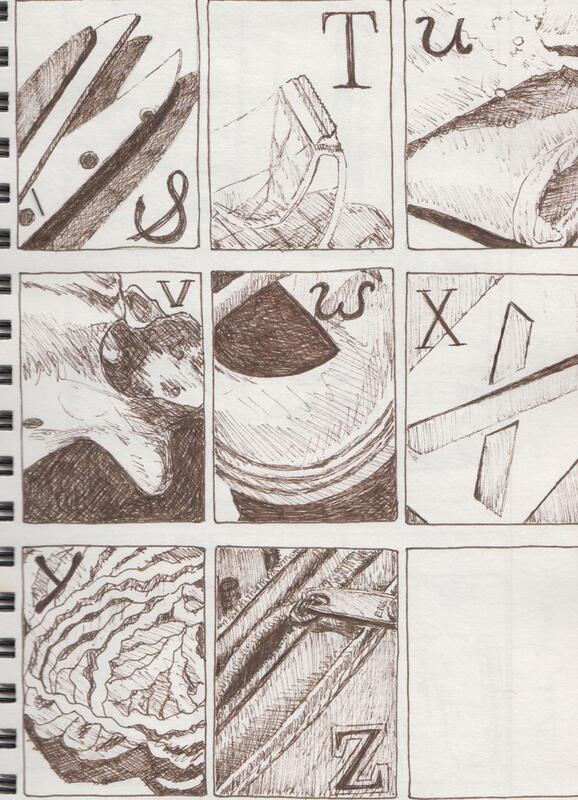 I started my drawings this week the same way I worked last week, in a very small format, with permanent ink. 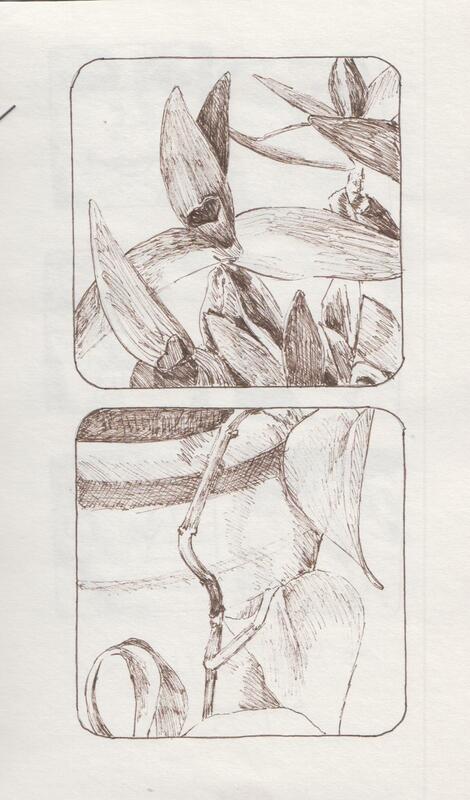 I went a little bit larger for sketches of a couple houseplants. Finally, my largest offering is still only 5 x 7 inches. It’s all good exercise, though. I started this blog after a period of great loss and sadness in my family. I wanted to slow down, to savor the days and to pay attention. Writing has helped me to do that. 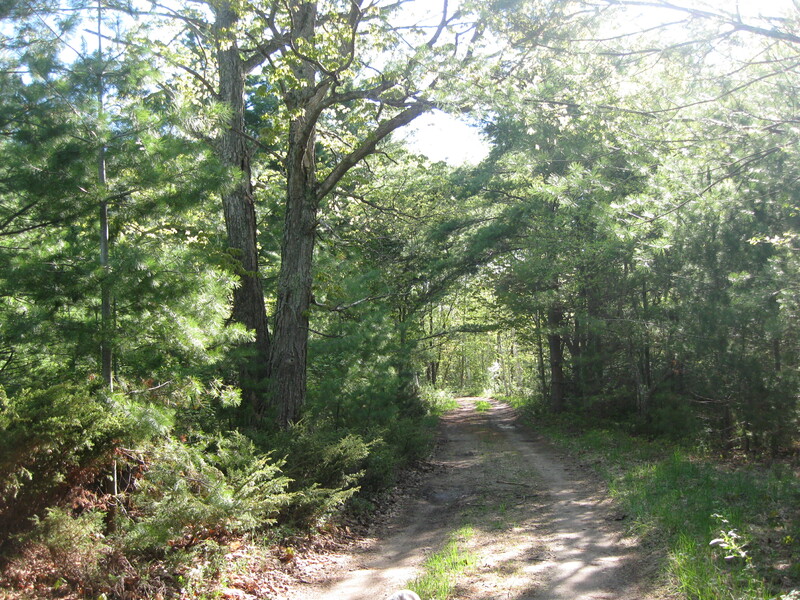 Old Age…or Life in the Woods? Of course I’m old. Not that old…but old enough. 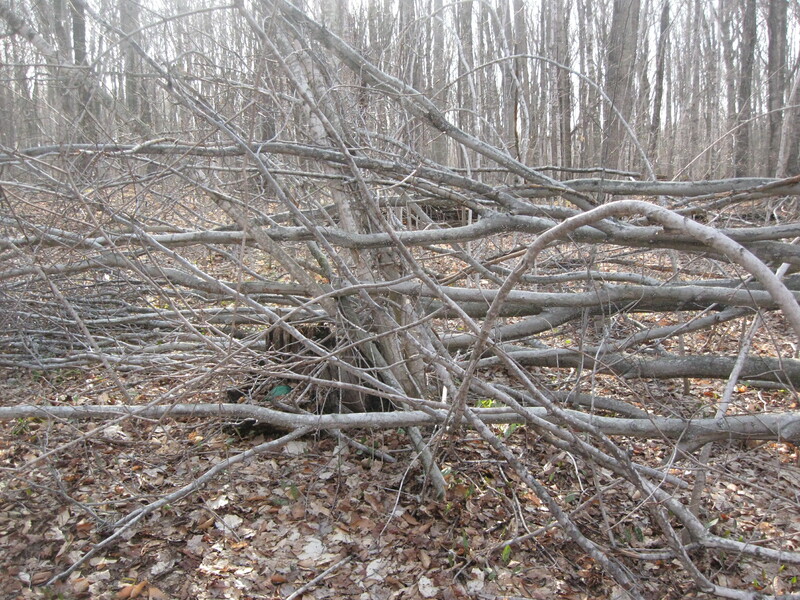 My house was built on the front, semi-cleared area of a woodlot. 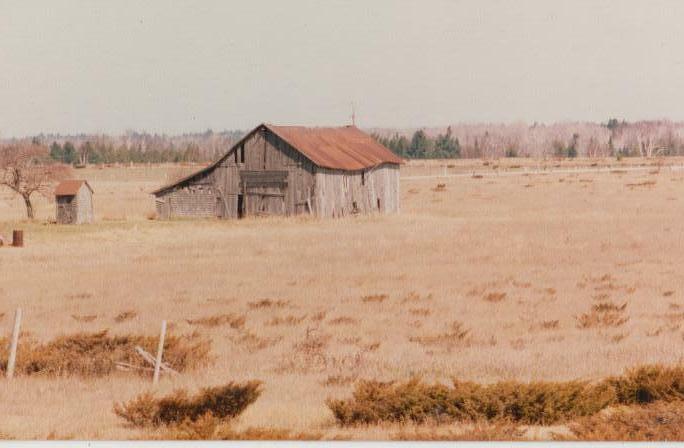 This was a farmstead over a hundred years ago. Large maple trees with rock piles at their bases mark the old boundaries of the plowed fields. Still, the woods want to move back in. We removed a dozen small trees to make space for the foundation of this little house. In the thirty years since, I have removed a dozen more – as well as over a hundred wild juniper – to make room for a garden, and to have a small lawn. 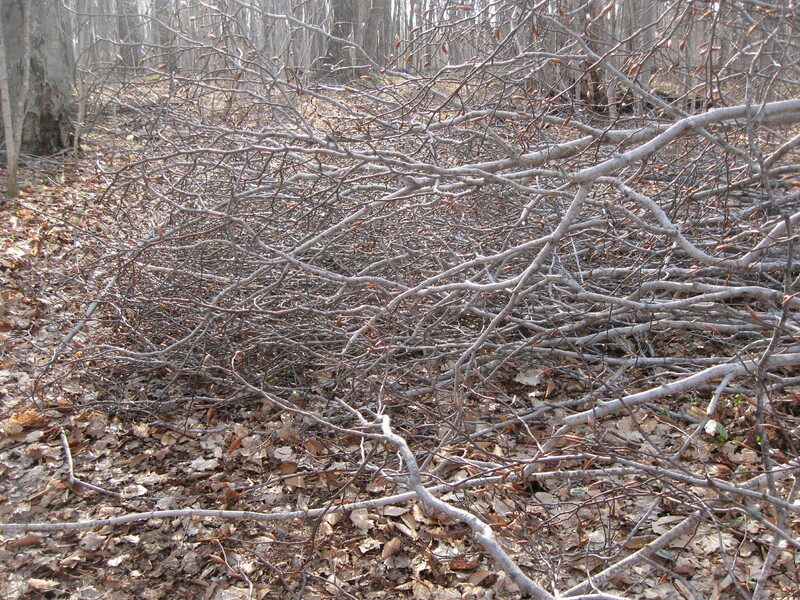 I’m having three overgrown, diseased wild cherry trees removed this year, along with a pine tree that is threatening to take out my electrical service in every big wind. Clearly, I live in the woods. My sister, Brenda has developed “floaters”. Fortunately, I developed them several years ago, so I could enlighten and advise. Brenda is one year and twenty days older than me. She hit puberty a full three years before I did. She reached adulthood at least ten years ahead of me. Maybe more. Being the oldest child in our large family, Brenda had to grow up fast, to allow me and the other younger siblings our “slacker” childhood. She may be making up for that now. It makes me wonder what other secrets are waiting. Floaters, in case you don’t know, are caused by the stiffening and separation of layers of the eyeball, usually due to age. It causes the afflicted to see tiny dark spots moving in their peripheral vision, randomly and annoyingly. Because no one had advised me of this, and because I live in the woods, I didn’t know I had floaters. No-see-ums: the tiny black, biting gnats that come out in swarms in the Spring of the year. Because the wind will carry them away, they like to get inside the ears, behind the eyeglasses, under the collar or at the hairline. There, they take an enormous bite with their tiny jaws, usually leaving blood running and an itchy welt. They look amazingly the same as floaters. Finally, it started to dawn on me that this was a vision issue rather than a living-in-the-woods problem. Then I wondered about a detached retina. Or a stroke. Or several other scary scenarios. Lucky Brenda – not living in the woods – thought about stroke right away! 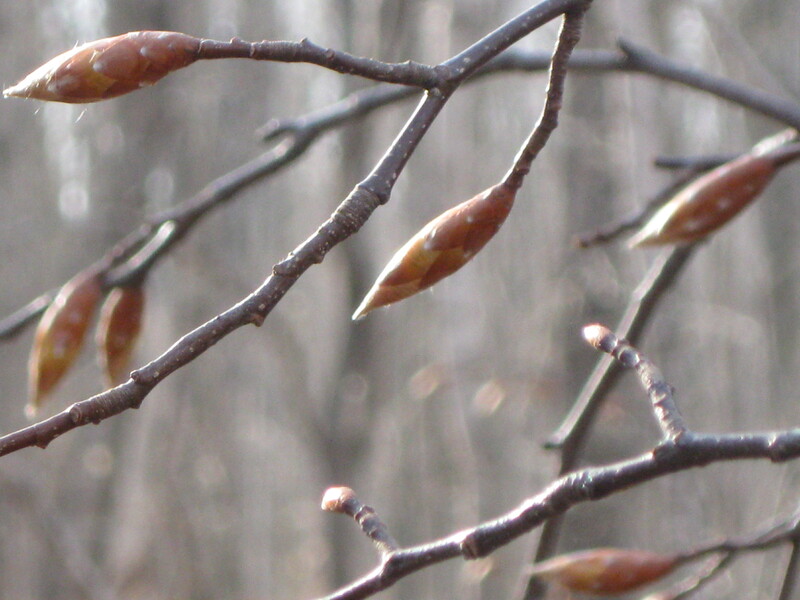 Now, this year, after what seemed like an exceptionally long winter, Spring has arrived on Beaver Island. 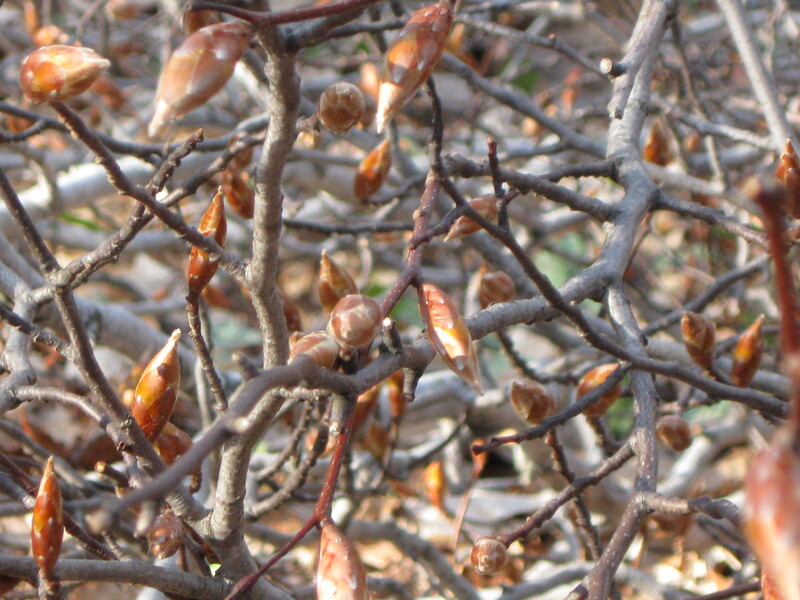 What a noisy Spring it has been, too! I’d lay down at night and hear loud chirping. Such pleasant sounds of the season! Birds…at night? Was it the little peepers? Crickets? I read somewhere this was going to be a tremendous year for Cicadas. Maybe I was hearing Cicadas. After several nearly sleepless nights spent trying to decide what life form was making the sounds that were keeping me awake, I decided to try earplugs. No offense to Spring and all of the sounds of the season, but I need my sleep. Oddly enough, the sounds are just as loud with ears plugged. Come to find out, once again this has nothing to do with living in the woods. It seems I have Tinnitus. I’ve heard, at least, of Tinnitus. A problem of the inner ear (most often associated with age) that results in a buzzing or ringing in the ear. Or, as in my case, the sound of Springtime in the woods. Last week I opened a big can of worms. I jumped at the opportunity. Who wouldn’t? This is a chance to share in an activity that I love with another artist who’s skills I admire. An assignment and a deadline. With art, with writing and with life in general, I function much better with a specific task and a set finish time. Though I cursed every single deadline when I was in college, I get kind of nostalgic about them now. Thursday. That’s the day we will each publish our drawings. It started out fine. I had a week. 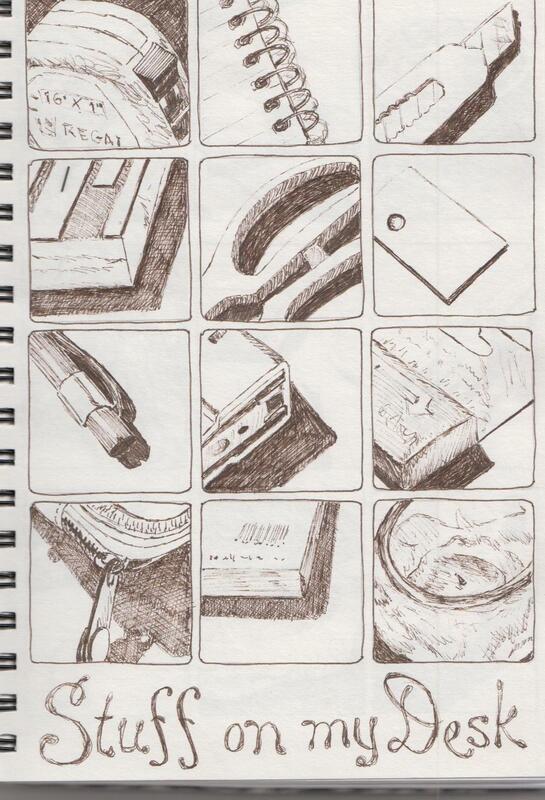 I set out pencils (Mars Lumograph, 6B) and paper (a sturdy bond in a size that would fit in my small scanner). I planned a little photo of these simple materials and a paragraph to explain my choices. I would scan my drawing and publish it right on time. I anticipated your awe (yes, all of you!) that from such humble materials could come such lovely work. That was before I actually put pencil to paper. Before all the talking to myself. I started and stopped. I found fault with the light, the materials and the subject matter. 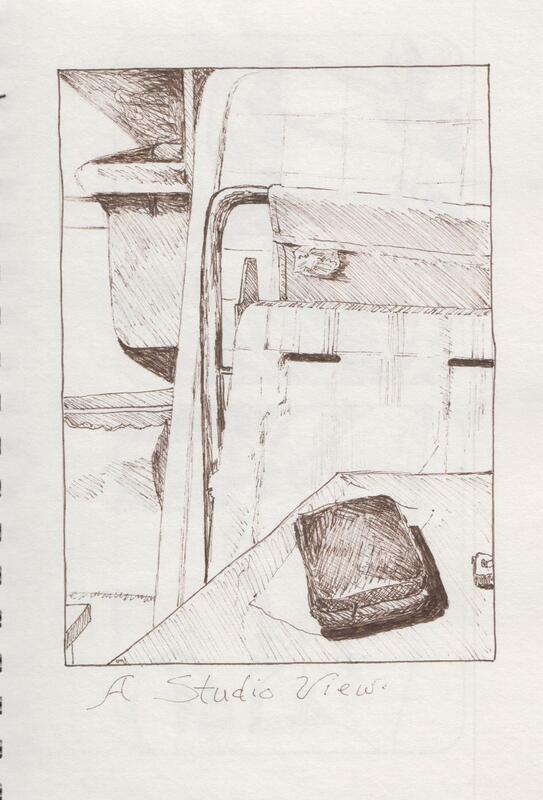 Even more so with my quality of line, my interpretation of depth and space and shadow. I erased. I discarded and started again. And again. Last night, with deadline looming, I started over. Out with the 6B Mars Lumograph pencils that aren’t as rich and smooth as I remembered them to be. Out with the sturdy bond in the 9″ by 12″ size. I pulled out my little sketchbook and my Indian ink pen. There will be no erasures. I framed in tiny (2″ x 3″) rectangles. Drawings will go edge to edge. 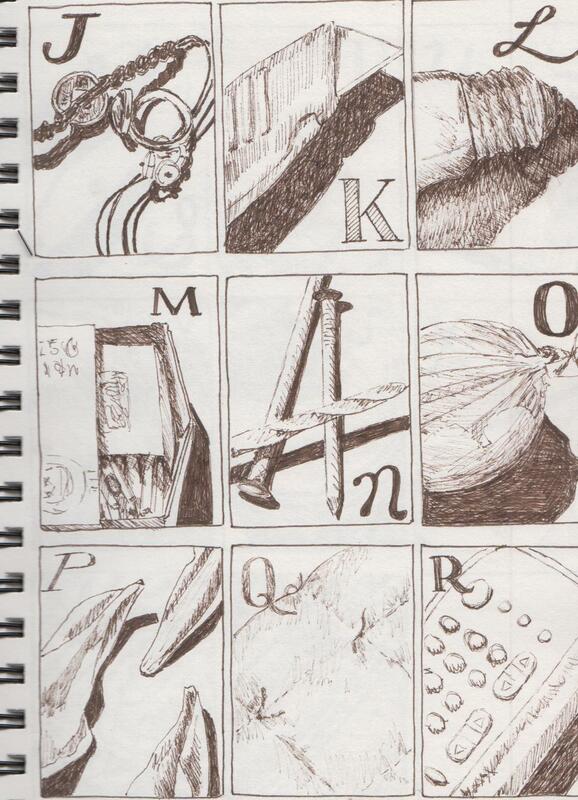 I used the alphabet to choose my subject matter (my friend will understand why). I kept going until I had something to offer. It’s not much…but it is tremendous in what I learned. I dealt with issues like lack of confidence, fear of failure and paranoia. I faced the fact that my skills have suffered from lack of use. I am unfamiliar with the feel of a pencil in my hand, have difficulty following a line, straight or otherwise, and struggle with coordinating eye and hand. These are all issues that beginning students deal with. I assure them, always, that these are learned skills that, with practice, they will master. Now, I’m reassuring myself the same way. 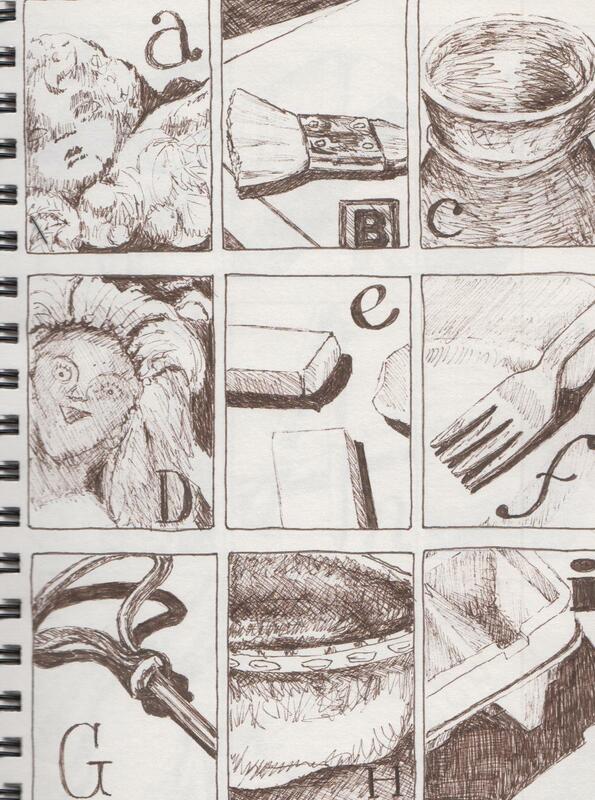 Thank you, Lisa, for this impetus to get back to drawing! 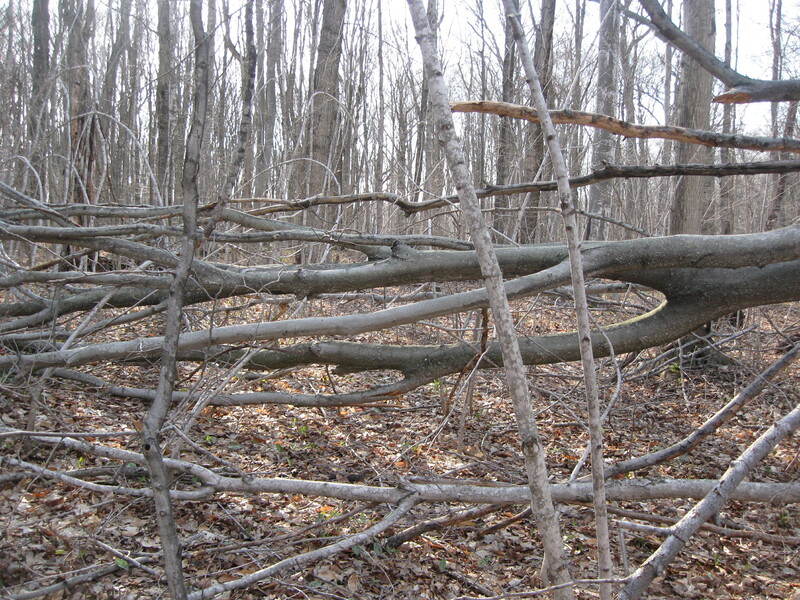 We had a severe winter storm last December that damaged many trees here on Beaver Island. As the Winter snows melt away, the Spring waters recede and the deep mud dries up, I’m able to walk the dogs through areas that have been impassible for months. 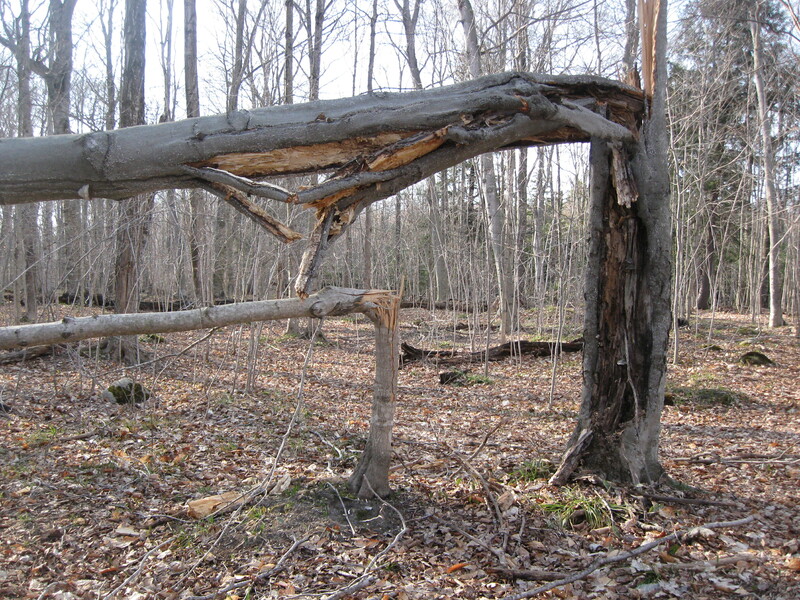 We often come upon trees that have fallen, casualties of that long ago storm. The big dog usually goes over; the small dog goes under. Most times I go around. 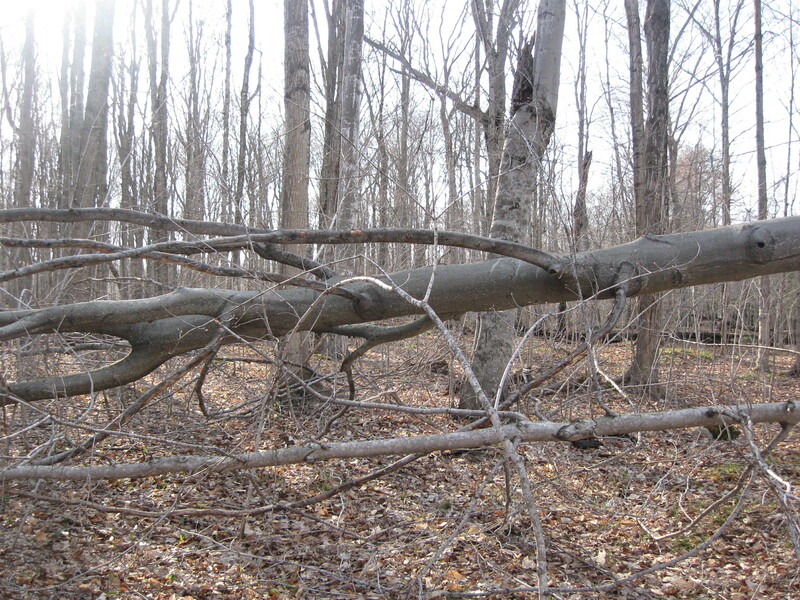 Last week, preparing to go off trail once again to circumvent the large treetop that was still in my path, I noticed a change that brought tears to my eyes, and caused me to investigate further. This is where the tree begins, far into the woods. The weight of the snow on its branches caused it to bow, and it eventually snapped. It took another, smaller tree down with it. It is laid out through the woods, forty feet or more of it, from heavy trunk to the tiniest, topmost branches, which are spread out across the woodland path. Yes, oblivious to the fact that the trunk has been severed from the earth, that death is imminent and unavoidable, this tree is about to unfurl its leaves in a show of Springtime glory! One of my entries here on WordPress was selected for “Freshly Pressed” a couple weeks ago. I think it’s a pretty big honor. I know it’s very flattering. That distinction brought several new readers and “like”-ers and “follow”-ers (Welcome!) to my blog. It also made me afraid that I would never again have anything to say that would come close to that quality of writing. Which would mean that from here on out, everything I write will be a disappointment (Sorry!). It really can be quite paralyzing. I had opportunity to talk to Jeff ten years later. He’d learned that fresh challenges present themselves, new experiences bring joy, and those high school memories fade into the past, so that they are no longer the yardstick by which all other experiences are measured. “And how did you come to learn that?” I asked him. “Well, I guess I just blindly kept going, and things worked out,” he said. So, with that magnificent, doomed tree and that thoughtful young man as examples, that’s what I’m doing. Maybe one with a better perspective than I have can see that it’s hopeless. Maybe my best is behind me. Oblivious to all that, I carry on. Mom is the one that always encouraged me to write. It’s true, I’ve always looked at life as a series of stories. Dis-function can be hilarious if approached in the right way. Disasters can usually be tempered into an amusing anecdote. Tragedy and sadness can be eased a bit, when shared. I certainly had lots of “crazy” family stories. If Mom knew how many of them she figured predominantly in, she may not have been so encouraging! When I was about five years old, standing on a stool at the bathroom sink, washing my doll, Mom came in and asked if I had opened the medicine cabinet. She was probably more alert than usual. Just a week before, killing time while waiting for my sister Brenda to get off the pot, I had been rummaging through that cabinet and seriously cut my thumb with a razor blade I found there. “No, I’m just giving my baby a bath,” I told her. She insisted she’d heard it open. I stuck to my story. She whopped me twice: once for getting into the medicine cabinet, and once for lying about it. In fairness, I’m sure there were one thousand or more times when I committed a major infraction, didn’t get caught, and didn’t get punished. I’ve forgotten every incident…except the one time, fifty-five years ago, when I was unjustly spanked. That one stands out in my memory. The boys in our family went to the barber shop regularly, to have their heads nearly shaved into what we called a “butch” haircut. The girls took turns sitting on the kitchen stool to have Mom cut their hair. The styles varied, to – in Mom’s opinion – best flatter our features. I, for instance, was cursed with dark, thick rounded brows that met in the center of my face. Mom cut my hair short, then trimmed my bangs to mimic the shape of my eyebrows. A “pixie”, she called it. To me, combined with my small face, large eyes and pug nose, the cut made me look almost exactly like a spider monkey. Similarly, our clothes were chosen to flatter our looks and personalities. In Mom’s opinion, and to her taste. I, she thought, looked like a “little Dutch girl”. In clothing, that translates to ruffles at the collar, puffy sleeves, bright colors and rick-rack. Plenty of rick-rack. Today, I wear almost exclusively black. In the kitchen, Mom would prepare anything that was brought to her: Bluegill and Sunfish we caught in the lake; a whole beef tongue Dad picked up at the slaughterhouse; the raccoon my brother killed with a rock. With Sunday dinners and meatless Fridays and weeknight meals, there are dozens of stories about Mom and her cooking. “Yes, maybe you should,” she said. So that’s what we did. She had emergency gall bladder surgery the next morning! Bad, lazy and inconsiderate daughter that I was, I had only suggested the hospital to get her up from the sofa! In any gathering, Mom would be an enthusiastic participant for anywhere from ten minutes to one hour. That was it. Then – to the chagrin of her much more social offspring – would come the toe tapping, impatient looks and directional gestures to whomever she had traveled with. No arguments; no talking her out of it. She wanted to go home. Time to say good-bye. These stories and others like them are the ones I’d think of when I thought about our “crazy family”. I don’t think that’s quite what Mom had in mind. Then my mother got sick. And then she died. She faced death with so much elegance, bravery and grace, all other stories were chased away. Everything that was hers, from her old blue fishing shirt to her menthol-camphor ointment, has taken on the importance of a holy relic. I wish I could remember every word she spoke, as it now seems like I should have always listened better. Every quirky habit that used to cause me to roll my eyes has become just one more thing that was special about her. What used to be reason for embarrassment is now cause to be ashamed that I didn’t appreciate her more. My mother’s death has become the story that defines her. I don’t think that’s what she wanted, either. 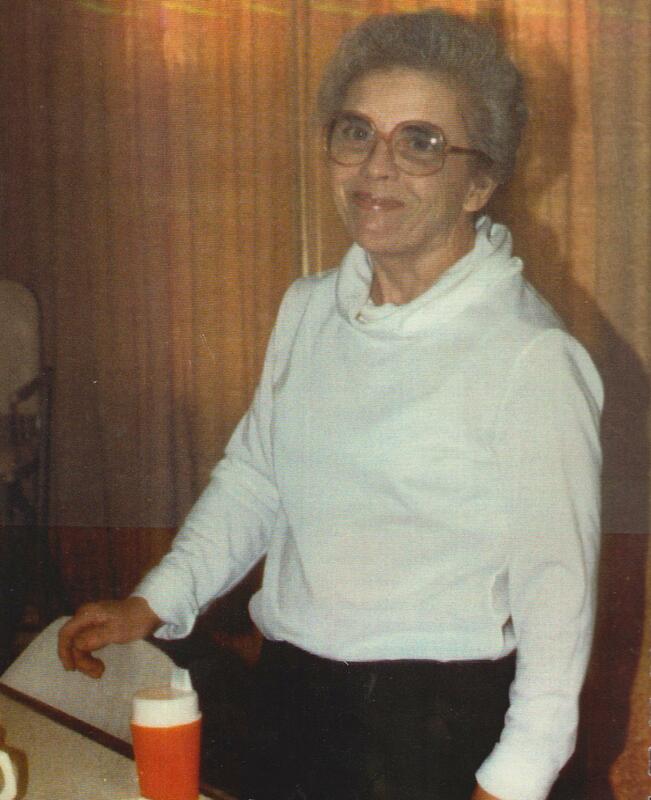 It hasn’t been quite two years since Mom died. I don’t know that I’m ready, yet, to tell her stories…but I’m beginning to feel like the stories are ready to be told. The seagulls moved inland the year Bill Wagner planted corn on my Grandpa’s island farm. They left the harbor where their gliding watch decorated the landscape and dirtied the docks. They abandoned, temporarily, the fishing boats where they lazily waited to claim the discarded remains of each day’s catch. For the novel taste of earthworms and slugs, they came inland to follow the slow, gray tractor as it muddled over and plodded through the tough, overgrown fields, left fallow for thirty years. My Dad noticed them first. “Get my gun,” he shouted to my daughters, “here’s dinner!” They remembered his similar suggestions at holidays, that Santa’s reindeer might make a good venison stew, or that the Easter Bunny might be good to eat. They knew he was teasing. Still, both responded with the squeals, looks of horror and groans he expected, and that made him grin. Seeming more like one large, feathery organism than several hundred birds, the seagulls followed the tractor closely. Seagulls hovered overhead, flapped alongside and marched behind, like white rag ribbons bouncing along with the humming machine. Bill led the parade daily, tilting over the broken soil with the birds, like bouquets of kite tails, in close attendance. They gave him the comic appearance of a balloon man. The seagulls stayed when Bill went home at night, keeping watch over the tractor and the plow. Impatient to get started each morning, the birds were already fluttering busily, vying for position, as the farmer made his early trek across the field to begin his work day. Dragging the plow behind, the tractor slowly transformed the field. The first pass lifted the earth in clumps, pulled out the juniper, tossed up a few rocks. The second time over, the lurching machine turned the brittle grass under, exposed the roots and left a finer texture. With the disc attached the tractor made waves in the freshly turned, dark earth. Fertilizer next, then the planter left crooked rows of yellow kernels as the small machine moved grudgingly over the stony field. Another swipe covered the seeds, and a deposit of weed killer completed the job. The work took nine days from start to finish. Bill plowed one long day in the rain, and allowed the rain to keep him home the next. The seagulls had perfect attendance. We watched the progress from the house and yard. Aunt Katie drank her morning coffee on the kitchen porch, to enjoy the smell of freshly plowed soil with the morning sun. After dinner she and Dad took their beers outside. Leaning back in their lawn chairs, they followed the tractor’s path with their eyes as their voices and laughter filled the evenings with sound. My daughters protested the change. “Nothing’s going to be the same!” they told me day after day. Every report was a sad one. Each pronouncement, they thought, was the one that would finally raise me up and drive me out of the house, to throw myself in front of the tractor, if necessary, to stop Bill’s wild destruction. In my own childhood, we made paths, piled stones, made forts and “hide-outs” in the tall grass. We found wildflowers and berries and caught fireflies as we roamed the fields morning and evening. “Watch your Grandpa,” I told them. Every day Dad walked the field. His long stride covered the rough ground easily. He seemed to be measuring with his steady pace. He moved quickly, as if he had a specific destination, then stopped suddenly, and without plan, to study the changes around him. Feet planted firmly in the soil, his legs formed a triangle with the ground. His broad shoulders rounded, back swayed and arms akimbo with thumbs hooked into his belt loops, hands resting on his hips. He would stand for so long, surveying the daily progress, that his solid form could have looked like a statue. Except for his head, nodding his grinning approval at everything he saw. Now, that field has been planted nearly every year for more than twenty five years. My cousin, Bob, has it planted this year with alfalfa and kale, in anticipation of pasturing his lambs there. Aunt Katie still lives in Grandpa’s farmhouse there, as she has since she retired. Though she’s older and more frail, she still enjoys having a beer outside in the evening, to watch the activity on the farm. Bill Wagner died many years ago; he’s still remembered and respected as a good man and a hard worker. My daughters are long grown and gone from home, with children that wander the fields when they come here. My Dad, so hard to believe, passed away close to fifteen years ago. Many things have changed, with the passage of time, but the memories flutter, like those long ago seagulls, so close and so vividly that I can almost hear the laughter. It seems that rumors are swirling around, here on Beaver Island. Just coming out of a long winter, that’s not surprising. It does surprise me when the talk is about me. That is rare. I keep a low profile. Rumors suggest that I am planning to leave Beaver Island; fed up, disappointed, I am moving away. I worry about how that makes people feel. Those people who have supported my endeavors, employed me, helped me when I’ve needed it. Those who’ve made sure I had heat, or transportation, or wine as the situation warranted it. Those who have been my friends. Beaver Island and its people have not disappointed me. This place has always felt like home to me; that has not changed. I love almost everything about my life here. However, I have been sending out resumes. Well, more accurately, I sent out one resume…which led to a quick trip downstate for an interview, a nice chat with a group of hard-working administrators, and a kind letter of rejection. I may send out more. I am looking into possibilities. Over the years, I’ve come to many forks in the road, and made decisions based on what seemed most sensible at the time. Sometimes, the options were limited. It often seemed like other, outside, circumstances played a large role in the choices I made. There were always reasons. But when are reasons only excuses? How often did fear dictate my choice? Or a desire to not move out of my comfort zone? Recently, faced with the possibility of working in a career that would enable me to use my skills, education and capabilities in a creative manner, I realized how much I wanted to do that. I also realized how weary I am of working without ever getting ahead. I’ve had some good jobs that allowed me to pay the bills, which is grand, and a big source of pride for me. But even in a job that kept me inside from dawn to dusk much of the year, I couldn’t actually afford to finish my house or take on a car payment. A roof repair, broken appliance or sick dog would throw my budget off for a year. I’ve also been thinking that I would like to retire someday. I have done nothing to prepare for that. So, I’ve been thinking of making a terrifying leap into a real career at this late stage. I’m sixty years old. If I’m going to do something, the time is now. But, the job market is not great, there are still limitations beyond my control, and I’m pretty old. The possibility is real that my endeavors will be met with other letters of rejection. I am not unhappy here. Not fed up with Beaver Island, not disappointed in its people. I am happy to have a job, happy to serve, happy on Beaver Island.